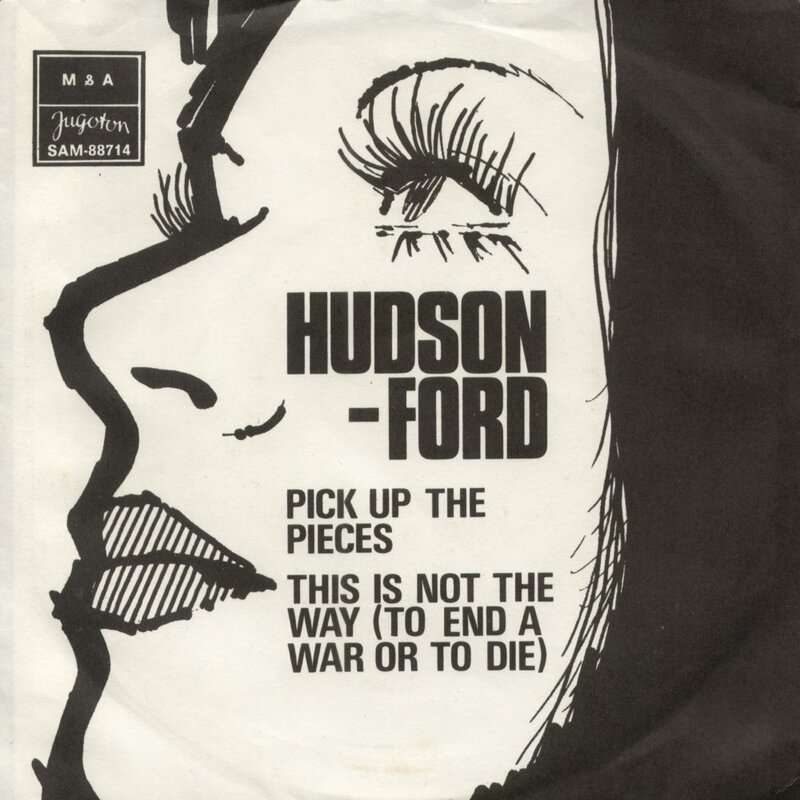 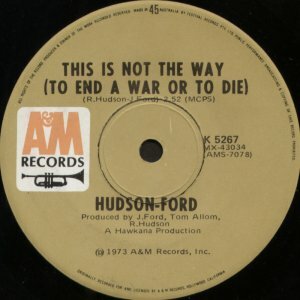 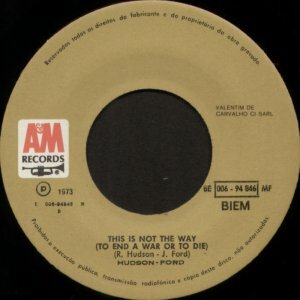 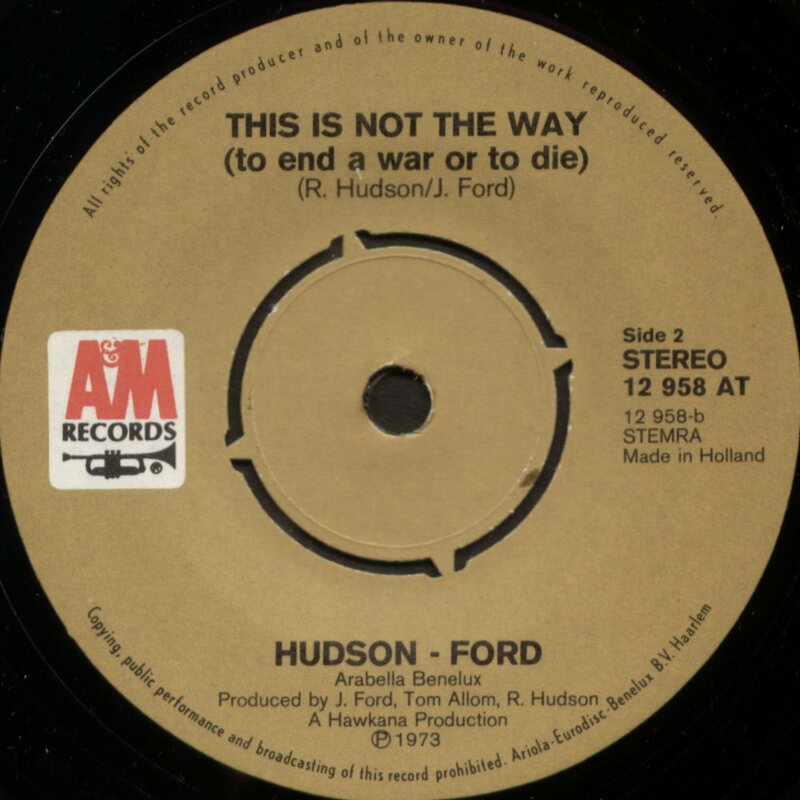 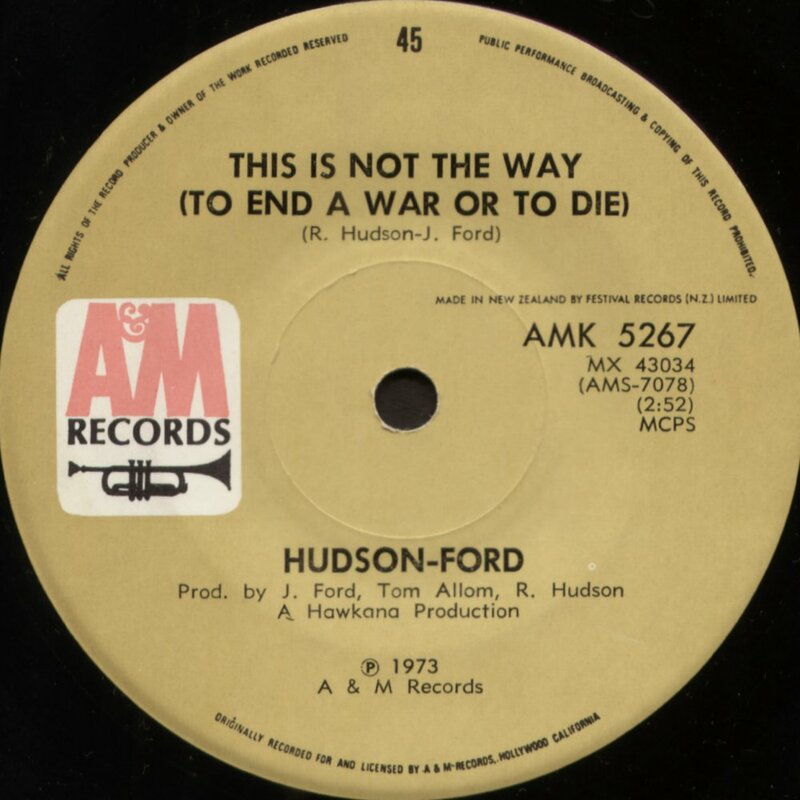 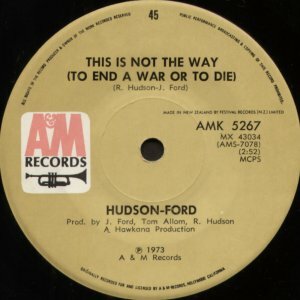 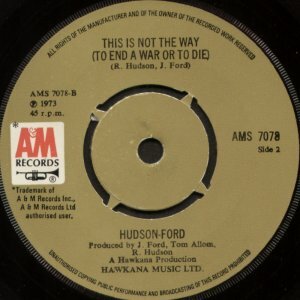 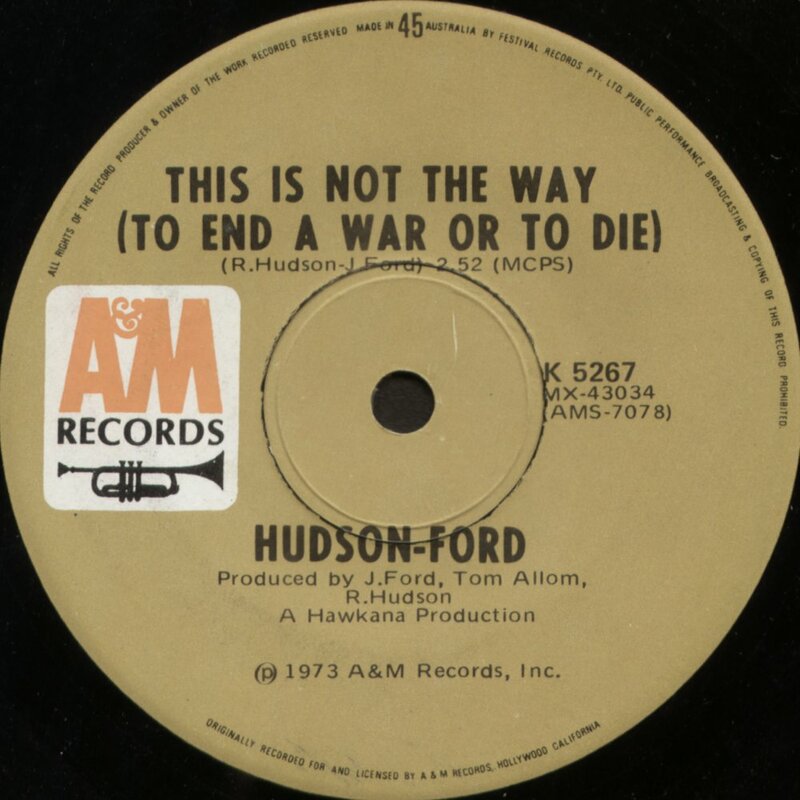 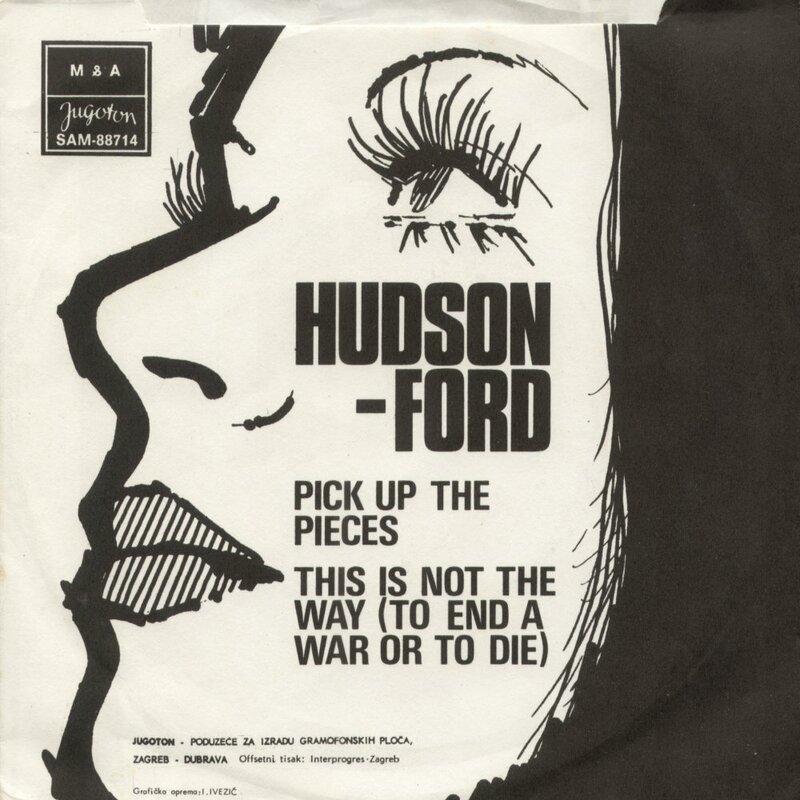 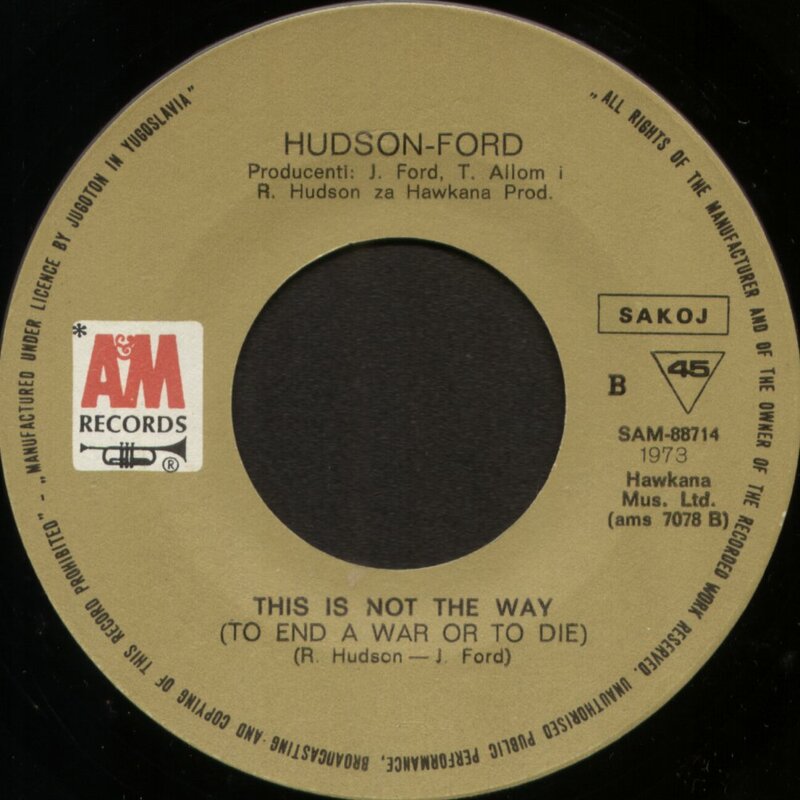 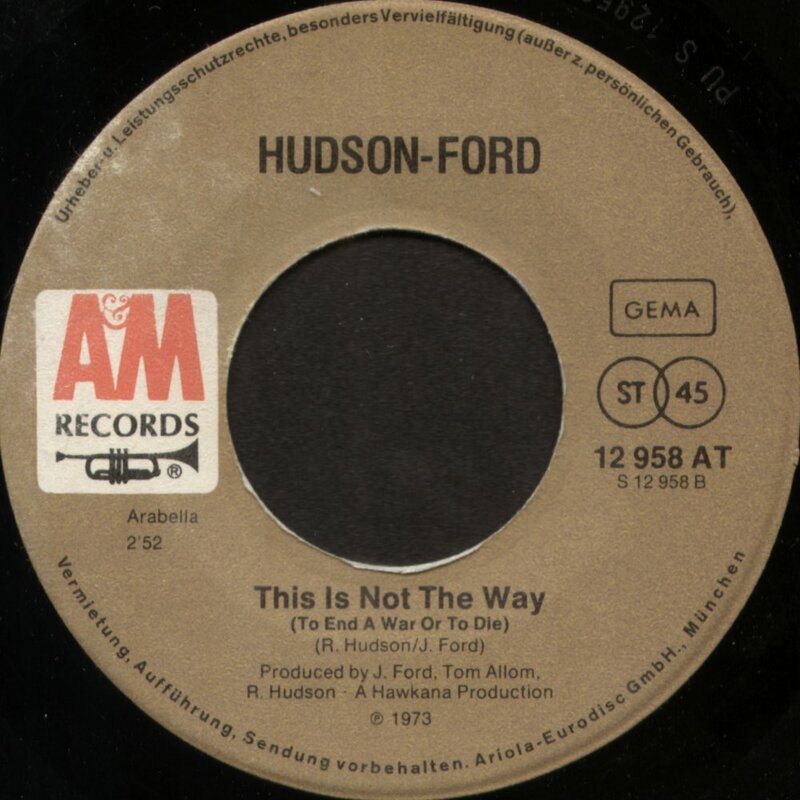 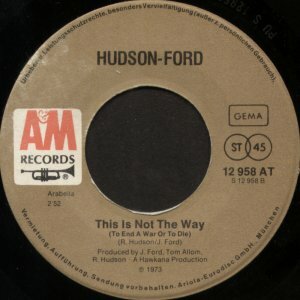 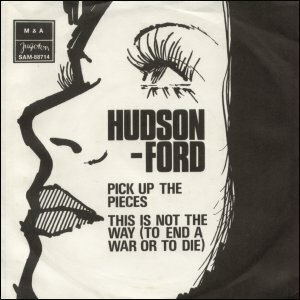 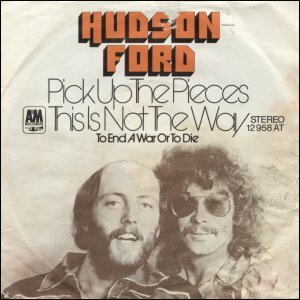 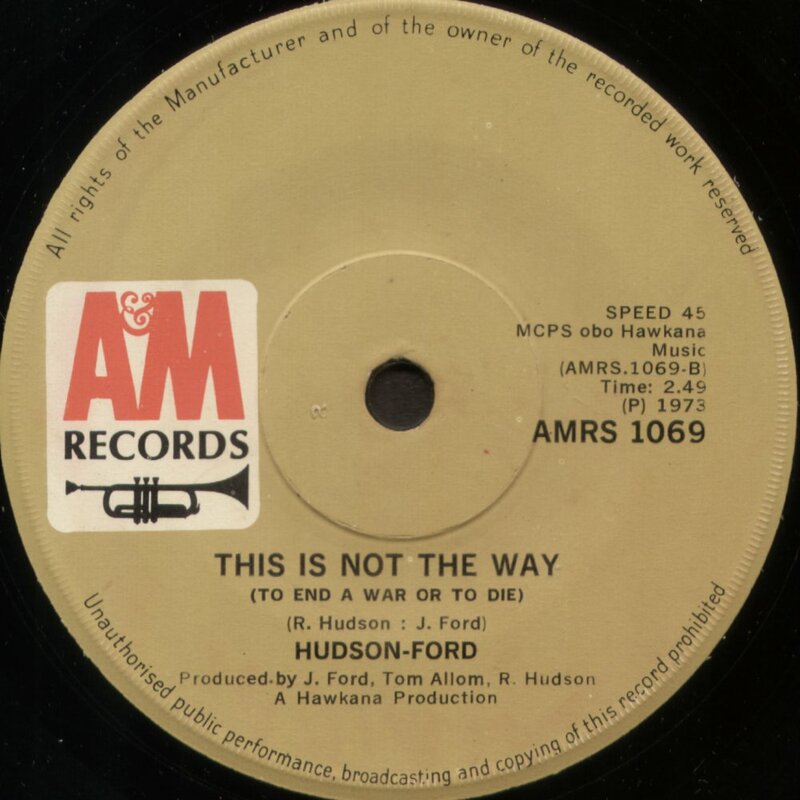 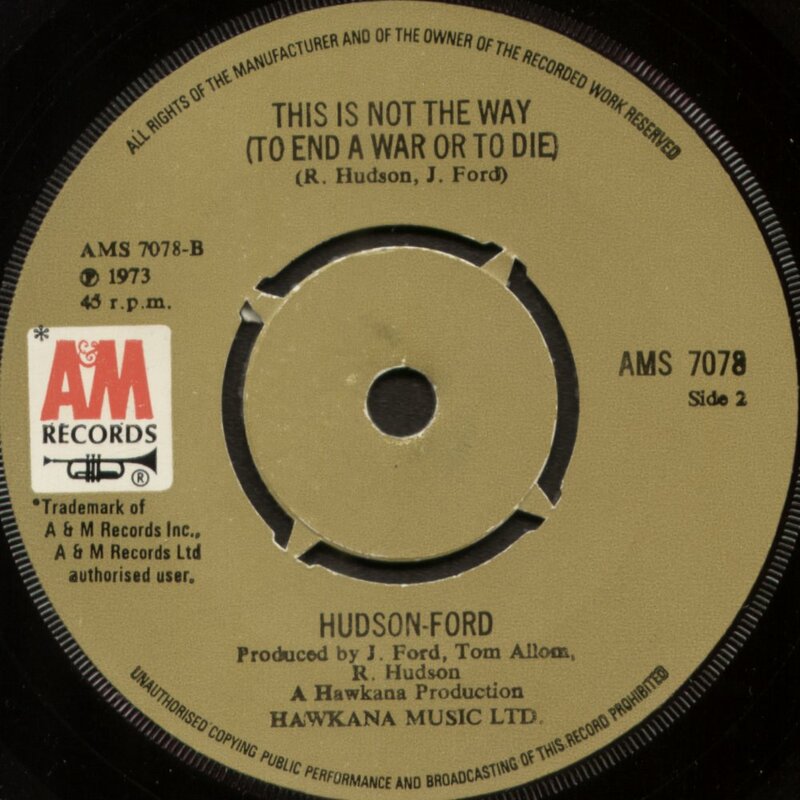 "This Is Not The Way (To End A War Or To Die)" is a non-album track and also appears on an acetate with "Part Of The Union", probably intended for release by The Brothers. 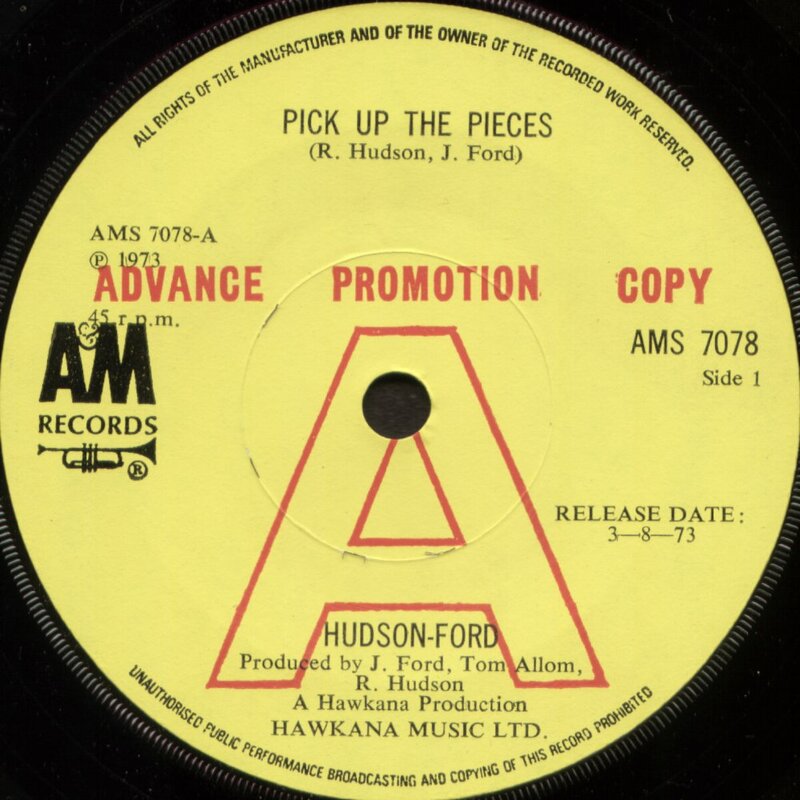 See the "Part Of The Union" acetate page. 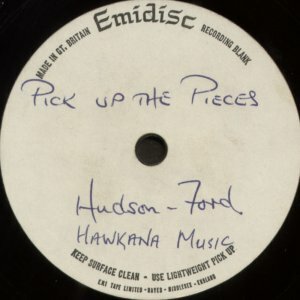 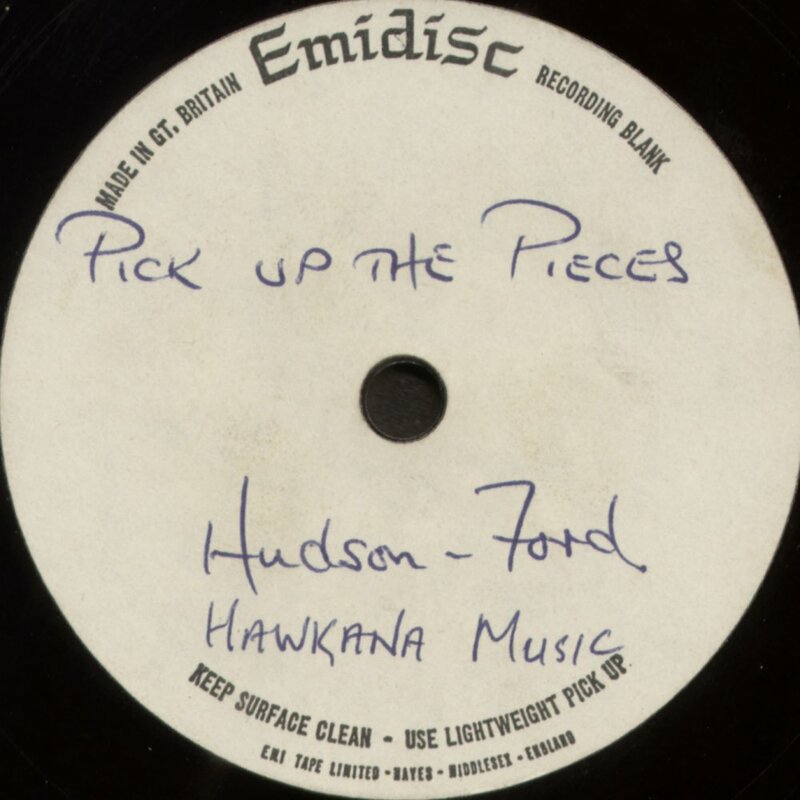 An acetate test pressing of Hudson Ford's first single. 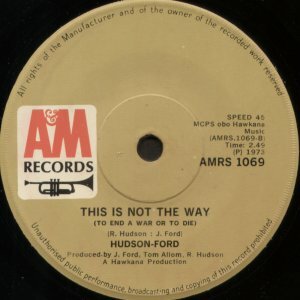 Nothing on the b-side. 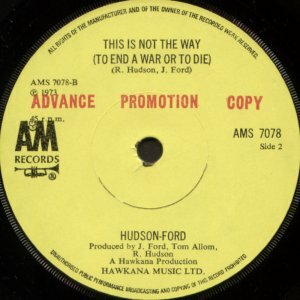 "Pick Up The Pieces"/"This Is Not The Way (To End A War Or To Die)"
A few scant months after splitting with the Strawbs, Hud and John released their first single at almost exactly the same moment as Strawbs released "Shine On Silver Sun". 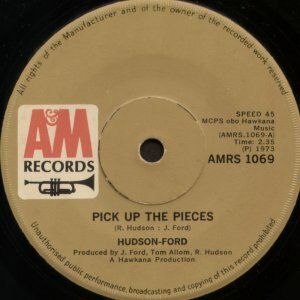 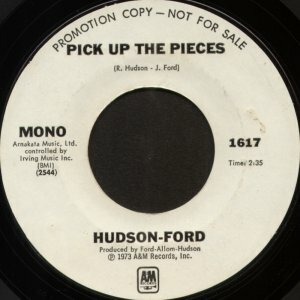 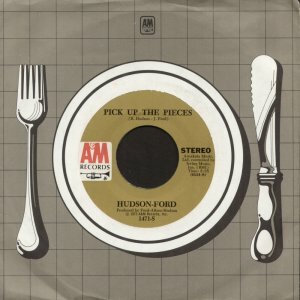 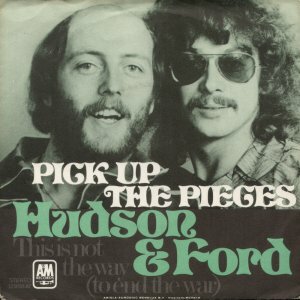 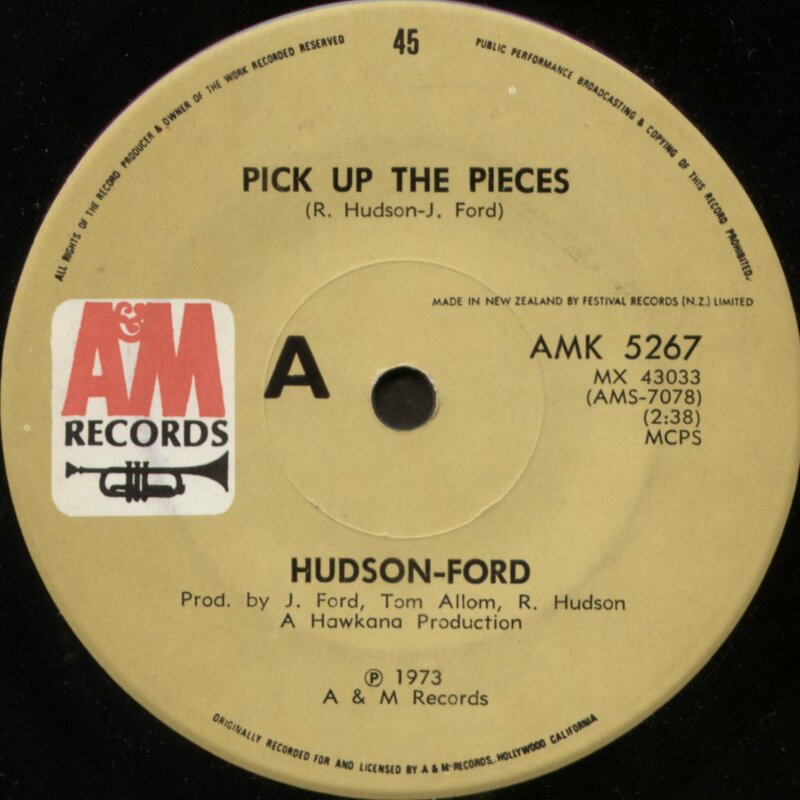 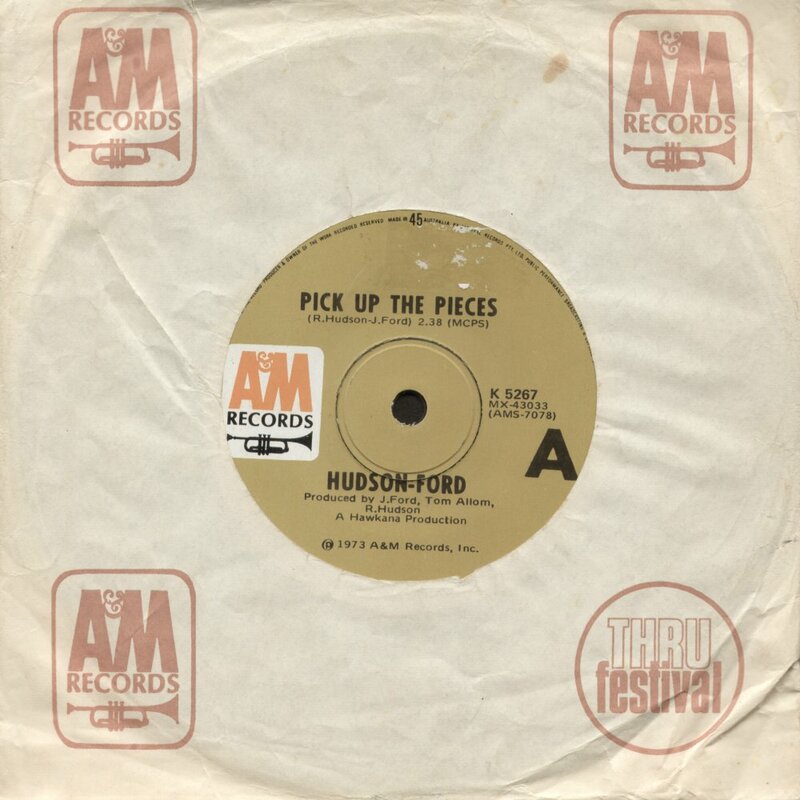 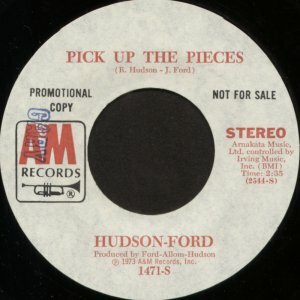 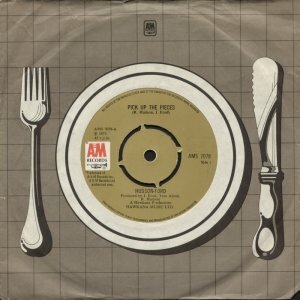 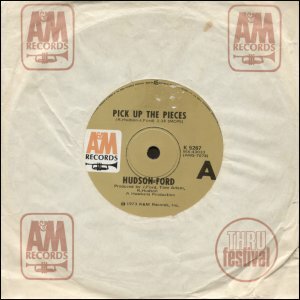 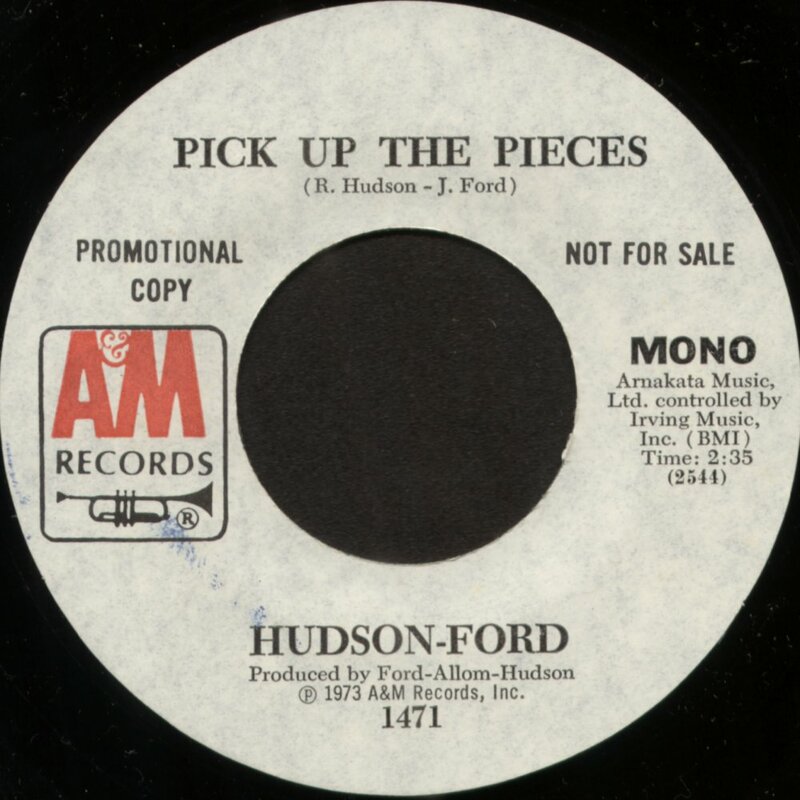 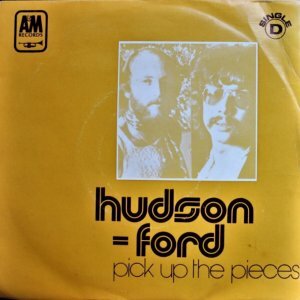 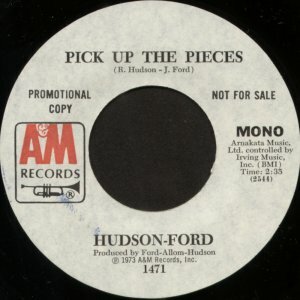 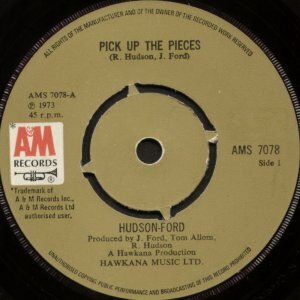 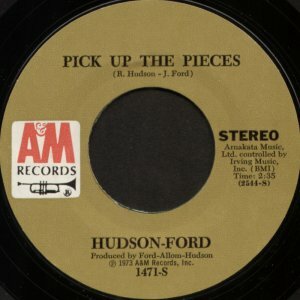 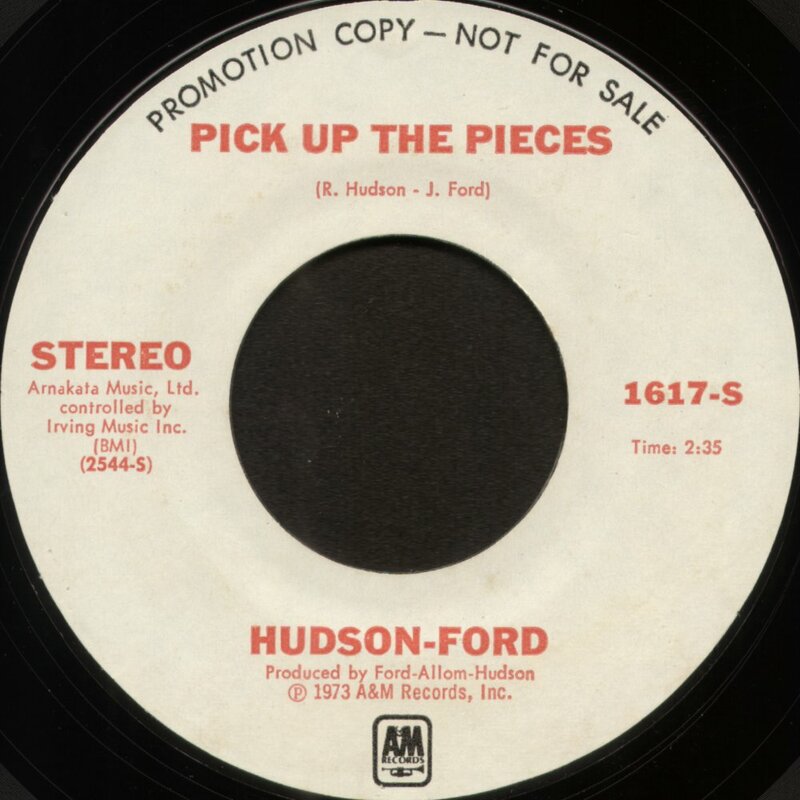 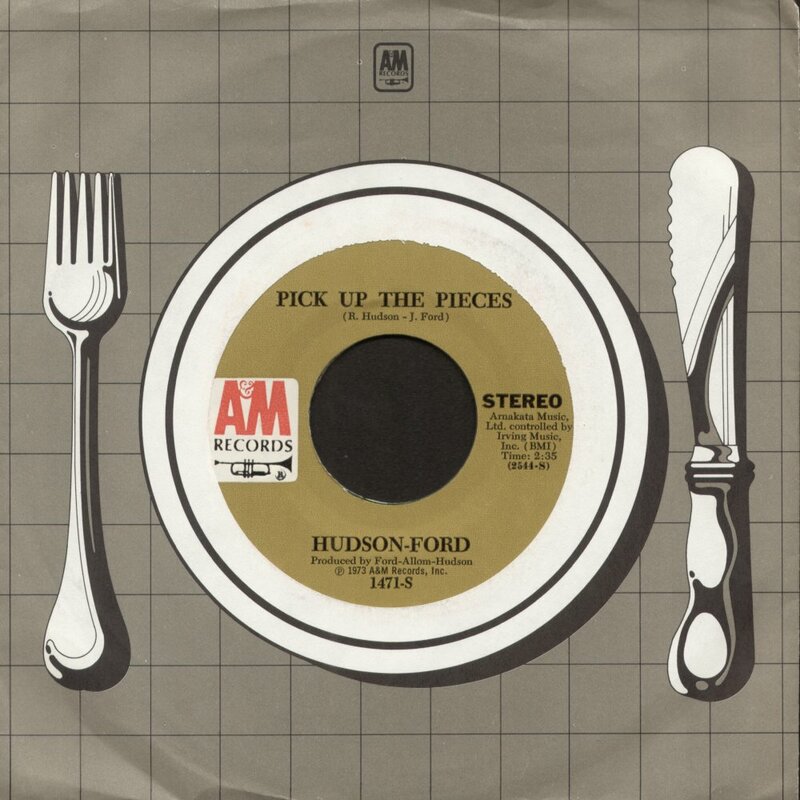 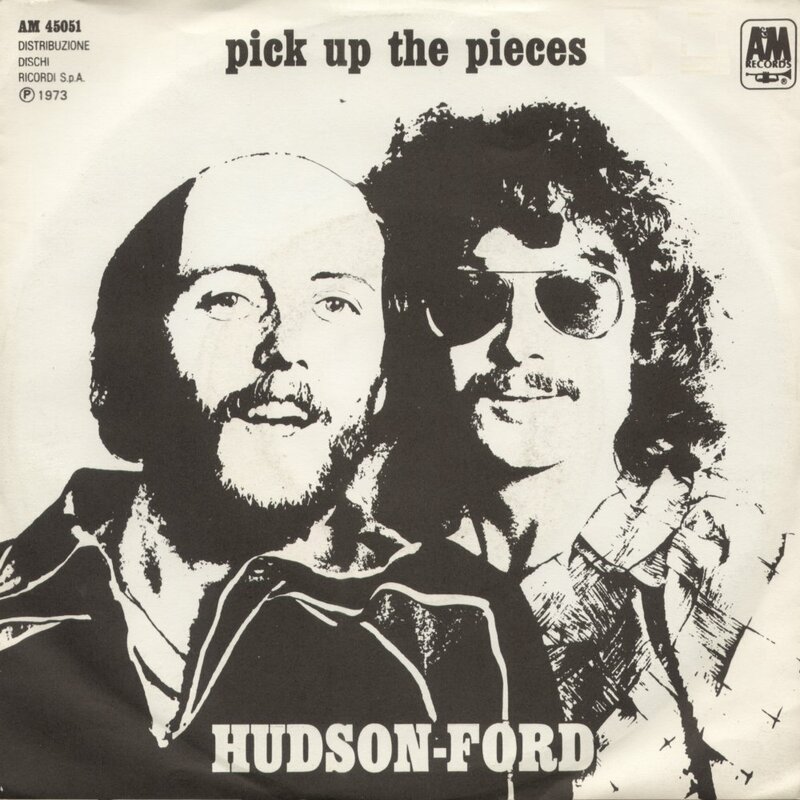 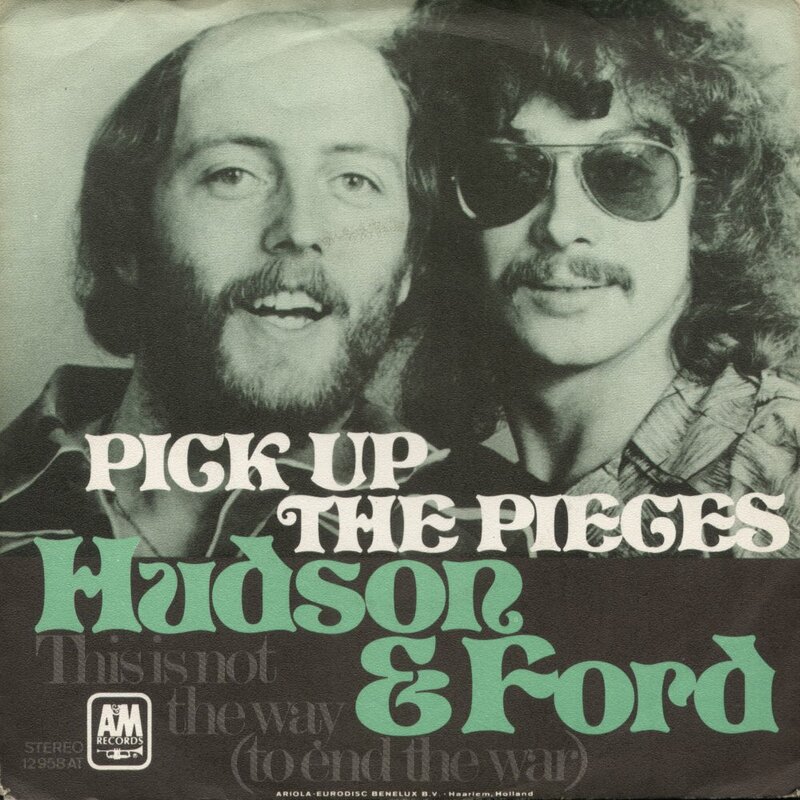 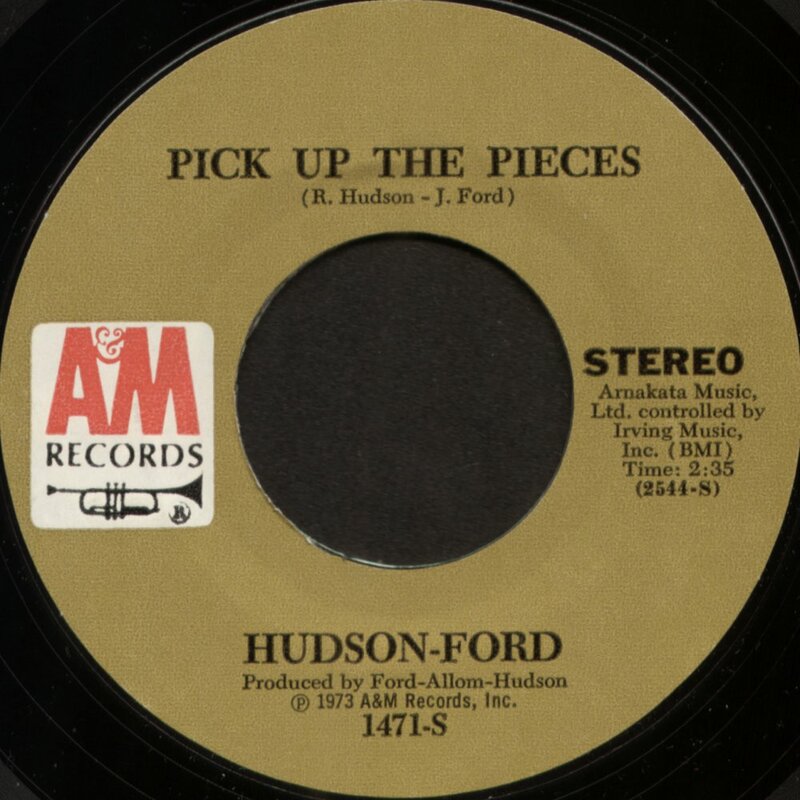 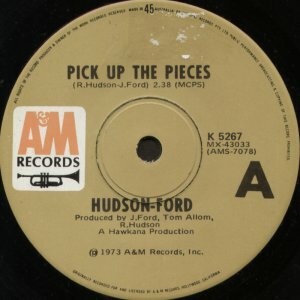 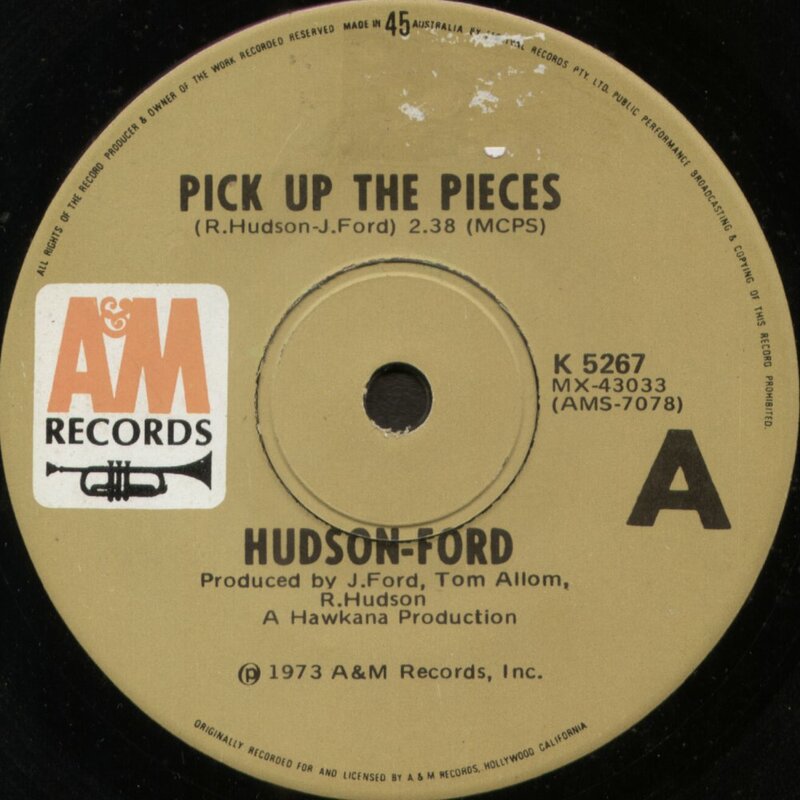 "Pick Up The Pieces [stereo]"/"Pick Up The Pieces [mono]"
"Pick Up The Pieces"/"Not The Way To End A War"
A later promo release in the US, using a later style of typography from around 1974 onwards. 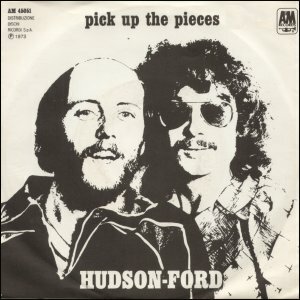 Date uncertain, but best guess is that it was reissued to coincide with their first set of US dates in 1974. 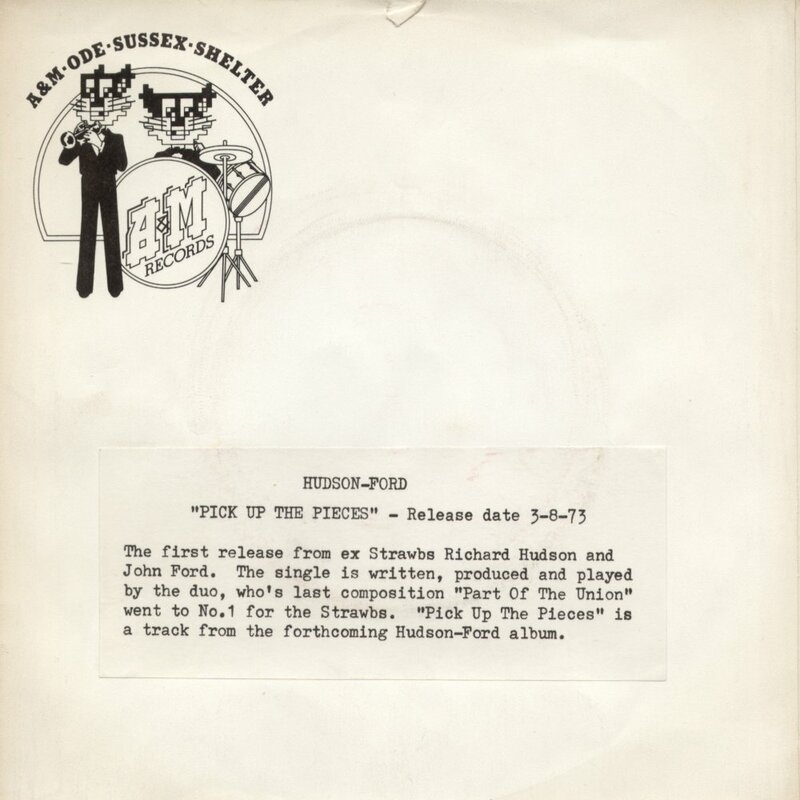 Not certain whether it had a full release. 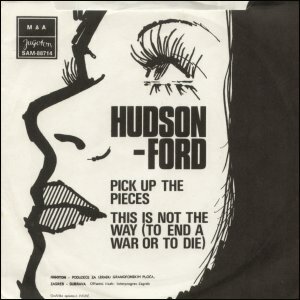 "Pick Up The Pieces"/"This Is Not The Way (To End A War Or To Die"
Same pic on both front and back of the picture sleeve. 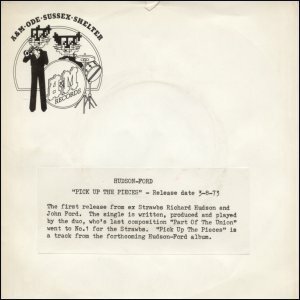 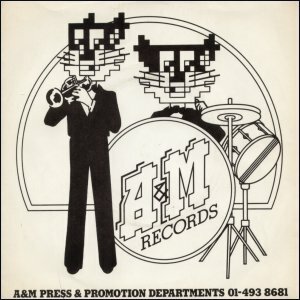 Same pic on both front and back of the picture sleeve, except for tiny writing at the foot of each: one refers to "Ariola Eurodisc Benelx NV - Haarlem, Holland"; the other has the same wording that appears on the Dutch releases of "Part Of The Union" and "Shine On Silver Sun" - "hoes: arno van ofsouw - amsterdam" (cover/sleeve by ..... ). Van Ofsouw was a prolific graphic designer in Netherlands - look him up on Discogs! Not easy to see, and certainly hard to scan, the lighter area above "hudson-ford" is a photo of Hud and John, clipped from either end of a promo shot for "Lay Down" (featured as two parts on the Portuguese release and in full on the Danish release of "Lay Down"). 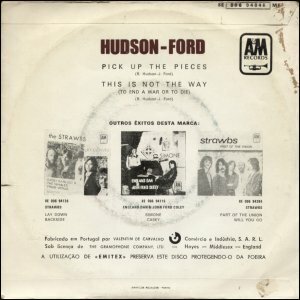 Same black and white pic on both sides of picture sleeve. "Jugoton - Poduzece Za Izradu Gramofonskih Ploca" - "Jugoton - Company for production of Gramophone Records"
"Zagreb - Dubrava Offsetni tisak: Interprogress: Zagreb" - "Zagreb-Dubrava Offset printing: Interprogress: Zagreb"
"Graphica opremo: I Ivezic" - "graphics by: I Ivezic"